I’m a strong proponent of fed is best but boy does being a formula feeding mama complicate things when you are traveling. Formula feeding adds on a whole extra layer of equipment and logistics to think about and was arguably one of the things I stressed about the most before we started traveling with our little lady. 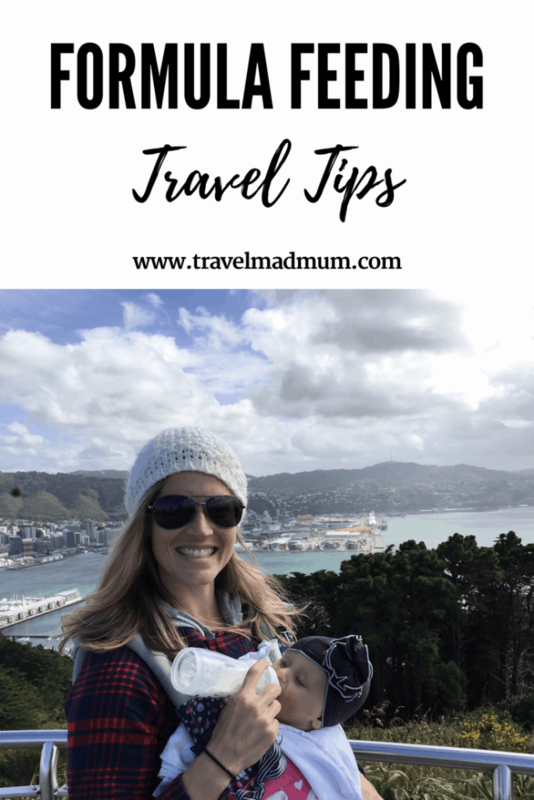 This post is all with formula feeding travel tips and lessons we’ve learned. 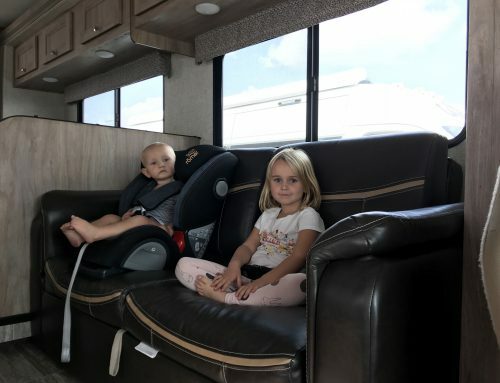 Hopefully I can help ease any anxiety you might have about traveling as a formula feeding parent. This is not a sponsored post, just items I swear by for any formula feeding mom or dad! 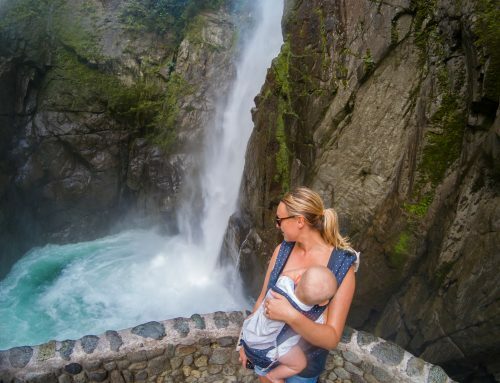 If you are looking for breastfeeding travel advice, we have the article for you here. I highly recommend bringing your formula with you (within reason of course). It may seem like a no-brainer, but many parents would disagree with the value of schlepping your specific brand with you on your travels. You never know when your little one will refuse a different formula or if the new brand will give them tummy troubles. It is for this reason that we choose to bring our formula with us when travelling. These handy containers are perfect for any on-the-go parent but are extra useful when travelling. We used 2 of the PC Powder Formula Dispensers on our trip to get us through the day but any similar container will do. These dispensers allowed us to pre-measure out our formula to quickly mix up bottles wherever we were. Our go-to bottles for travel are the Playtex Nurser Baby Bottles and Drop-ins. We chose these bottles because it meant less stuff to carry around during the day and less clean-up when we got home which makes them perfect for travelling. No matter which bottle system you choose, you will inevitably be doing some washing at the end of the day so bring along your bottle brush and some travel size dish soap. No one wants to be searching for dish soap after a 36 hour travel day in a foreign country! Obviously sterilizing is less of an issue for the older babes. Some people argue that it’s not even necessary for the younger ones but we found sterilizing every few days worked for us. We chose the Latch Sterilize Bags as each bag could be used 30 times and held a lot of bottle parts (there are many versions of this product on the market). Sometimes we were washing bottles in hotel bathroom sinks and these bags gave us some peace of mind that things were actually “clean”. Pro tip: Most standard hotels won’t have an in-room microwave but if you ask nicely most hotel staff will let you use the staff microwave. We’ve taken a hybrid approach during our travels. When we knew we would have access to a kettle or stove top we brought a reusable bottle and boiled our water on the road. Other times, including for flights, we’ve opted for bottled spring water. Whichever option you choose, you can bring your water for formula through airport security, so think about which option makes the most sense for your travels. Book apartment style accommodation. Not that a regular hotel room won’t cut it (I mean a sink is a sink), but it’s just so much more convenient to have a proper kitchen sink, microwave and sometimes even a dishwasher at your disposal when you are formula feeding. Get your baby used to room temperature bottles. This was the best piece of advice I was ever given. Room temperature bottles mean you can truly feed anywhere and everywhere. That said if warming is a must, nearly every hotel, restaurant or flight crew will give you a cup of hot water to warm the bottle. 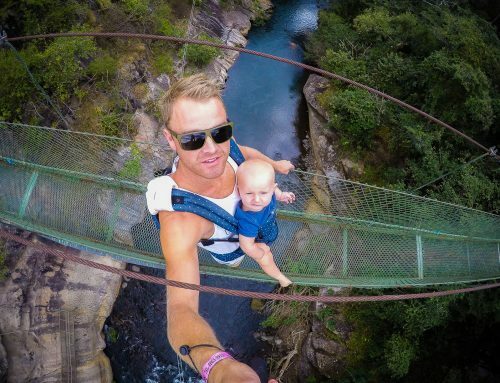 Get your baby used to feeding with distractions. This was the second best piece of advice I was given when we started bottle feeding. It’s easier said than done in the beginning but its worth the extra effort in the long run. Keep all your formula supplies together when passing through airport security. Formula feeding isn’t without accessories so zip lock bags will become your best friend. Keep everything together so its at your fingertips when you are going through security. Be prepared to answer questions. Fed is best. But not everyone agrees. You will likely hear, along with a confused or judgmental look, “Oh, you don’t breastfeed…how come?” more than once during your travels. When it first happened, I was surprised. Its good to be prepared for those situations. In the UK, Boots Pharmacy offer a pick up air side service. When ordering online customers have to select pick up in store at checkout. This saves the hassle of taking formula through security or using up valuable space in checked bags. If you don’t want to use the sterilization bags or don’t have access to a microwave, invest in some form of cold water sterilization system such as Milton tablets which can sterilize your baby supplies in 15 minutes. Use a thermos to keep pre-boiled water warm on long plane rides or travel days. 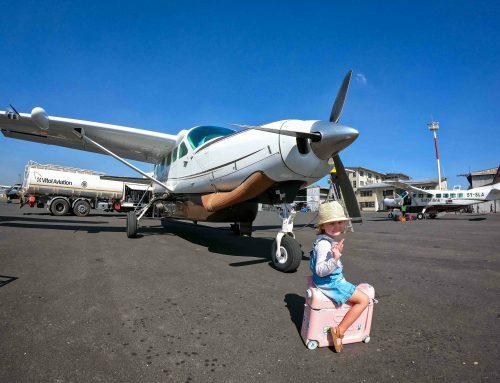 Have you found this article by Courtney on formula feeding travel tips helpful? We love hearing from you. Leave a comment and we can get back to you. I’m Courtney from From YOW with Love. My husband is Jeff and my daughter is Millie. We are a Canadian family living in the lovely, but often underestimated, capital city of Ottawa. We both work full time but have made travel and exploration a priority for our little family. 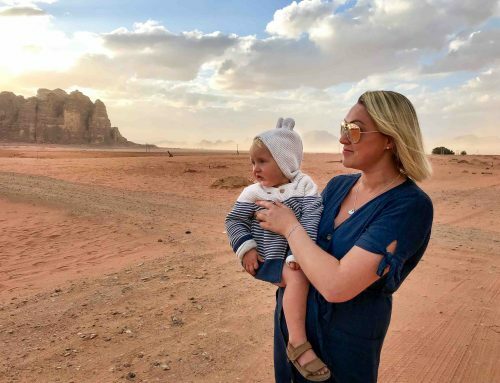 You won’t find perfectly edited photos and advice on full-time travel but you will find real life stories about our family adventures as we learn to live and travel with our one year old daughter. Could you elaborate about how you got your baby to feed WITH distractions? Doesn’t seem to be a lot of advice on this but instead about how to deal with a distracted baby. Thanks! Sam – we never leave the room to feed or shut off the TV. We feed everywhere and anywhere and have from birth so the little lady is used to feeding on public transit, at coffee shops etc. 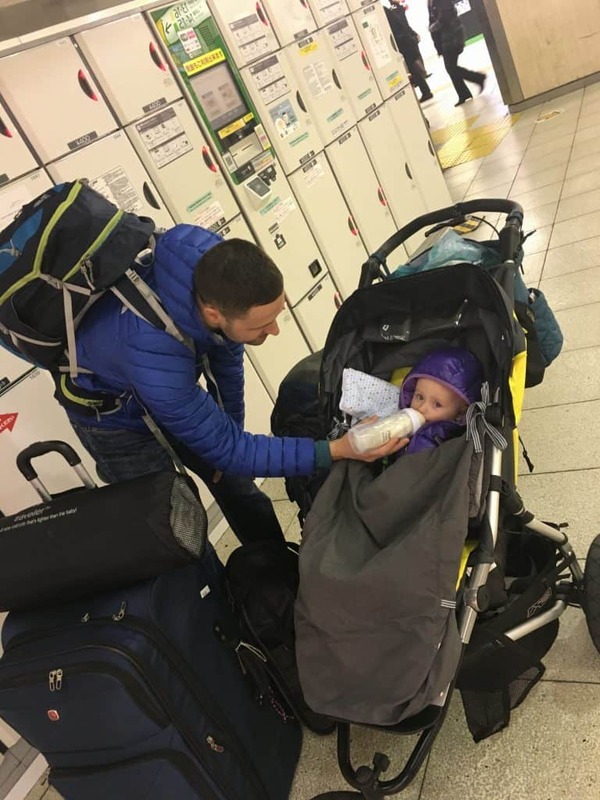 Such a welcomed post for us that can’t breastfeed and want to travel!!! A little tip, we use cow and gate and you can message them to ask if there is an equivalent formula (called something different) in the country you are visiting, this would save you bringing it. I completely agree with the room temperature bottles. It is so easy when you can just buy the small ready made bottles for plane journeys etc. Thank you for supporting bottle feeding as well ? Great advice! We are planning a trip to South Africa in January and our little one will be 7 months old. It will be our first international trip with our son. I honestly was most nervous about how to pack and implement bottle feeding during this trip. I appreciate the advise about bringing bottled Spring Water. In the US it’s recommended to use purified bottled water but I’ve found the ph balance is very acidic compared to spring water. Thanks again. I definitely feel more at ease about traveling with my formula fed baby. Thanks for sharing! We traveled for 2 months in Europe this summer, it was absolutely amazing, but I wished I would’ve read your tips before. We were lucky, because we order European formula in the US from https://myorganicformula.com/, so we could find the formula nearly in every store. Thanks for the advice! its a great help. We will be taking our 5 month old to Europe on a 5 week vacation. How would you recommend packing the formula? I will need to take about 12-15 cans. Do I leave the formula in the can. I am only wondering because the cans are so bulky and take up a lot of room.